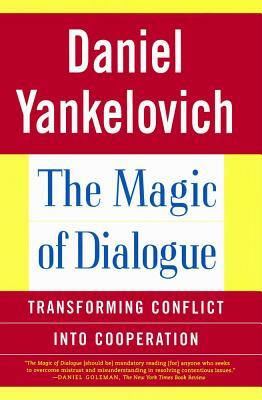 In this groundbreaking work, famed social scientist and world-famous public opinion expert Daniel Yankelovich reinvents the ancient art of dialogue. Successful managers have always known how to make decisions and mobilize coworkers. But as our businesses continue to expand, conversations and discussions just aren't enough to bring people and their different agendas together anymore. Dialogue, when properly practiced, will align people with a shared vision, and help them realize their full potential as individuals and as a team. Drawing on decades of research and using real life examples, The Magic of Dialogue outlines specific strategies for maneuvering in a wide range of situations and teaches managers, leaders, business people, and other professionals how to succeed in the new global economy, where more players participate in decision-making than ever before. Daniel Yankelovich is a leading interpreter of trends shaping American society and the global economy. As an advisor to large corporations, government agencies, universities, and communities for over forty years, he is regularly at the forefront of public issues. His new firm, Viewpoint Learning, Inc., teaches organizations how to foster new forms of leadership through dialogue. Yankelovich has received many honorary degrees and awards, including the prestigious Helen Dinerman Award from the World Association of Public Opinion Research. He lives in La Jolla, California, and New York. Daniel Goleman The New York Times Book Review The Magic of Dialogue [should be] mandatory reading [for] anyone who seeks to overcome mistrust and misunderstanding in resolving contentious issues. Sol Price founder, Price Club I'm sorry this book wasn't available fifty years ago. Reading it is bound to improve your effectiveness as a manager as well as your personal relationships with your fellow men and women. Craig Wynett general manager, Corporate New Ventures, Procter & Gamble [Yankelovich's] depth of insight and years of data on the deeper trends in human values make him an unlimited asset to anyone who seeks to serve consumers in every culture.